U.S. 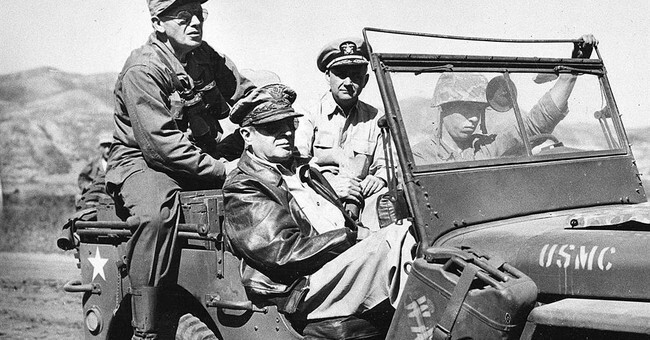 Generals Douglas MacArthur and George Patton were two of the most brilliant military minds in the history of modern warfare. Under their commands, American forces in Europe and the Far East decimated hundreds of thousands of enemy soldiers, making way for freedom in countries previously ruled by evil tyrants, and preserving our way of life at the same time. An essential element of their strategic approach to warfare was the knowledge that when an enemy is attacking on more than one front, you cannot rely on a single weapon or plan of attack; you must fight with as many options as possible, on as many fronts as you can. Today, Republicans in Congress could use some of that strategic wisdom in battling a President who is attacking the very foundation of liberty in America from all directions. There is little question that President Obama is waging total war against the rule of law in America. He uses “Executive Authority” to bypass Congress in making unilateral decisions by decree. He colludes with Democrats in the Senate to create gridlock, providing him more opportunity to justify his unilateral actions. He makes [now illegal] “recess appointments” to stack key government agencies with high-level bureaucrats to institutionalize his Big Government agenda. He tampers with congressional investigations into the gross misconduct of his federal employees through political pressure and manipulation. Those under him destroy evidence. And, to ensure immunity from legal consequences for his unconstitutional activities, he has compromised the Department of Justice -- turning Attorney General Eric Holder into his Enabler-in-Chief. According to reports, Boehner will call for a vote in the House in the next few weeks to authorize its general counsel to file suit against Obama covering a number of his executive actions. The lawsuit then will wend its way through the federal court system in the District of Columbia; hopefully to land eventually in the laps of the Supreme Court justices, where an important precedent will be set – one way or the other. The lawsuit is just one of four crucial “fronts” – including legislation, appropriation riders, lawsuits, and ultimately impeachment -- for Congress to use in stopping a president or an Administration operating outside the law and the Constitution. As I noted here last week, the House could begin sending to the Senate a number of bills narrowly tailored to specifically target, and reverse, onerous executive actions taken by the President. Not only would Obama then be forced to follow the law rather than making up excuses for acting on his own, it would at least force Harry Reid and Democrats in the Senate to explain why they have failed to allow any meaningful and realistic legislation from the House to reach the floor of the Senate. Appropriation riders would help cut funding for Obama’s fiat-created federal programs, as the House has the constitutional power to do so. Lastly, the House could begin an official “inquiry” into whether the President may have committed impeachable offenses, as a preliminary step in collecting and organizing evidence for possible impeachment. As Patton and MacArthur demonstrated on the battlefield, Boehner and the majority Republicans in the House should utilize all four “fronts” in the coming months to go on the offensive against Obama’s lawlessness. There is no better time than now to act, while Democrats still refuse to accept the reality they helped Obama create, in spite of defeats in the Supreme Court. Fortunately, voters increasingly are coming to recognize the danger of having a President allowed to exercise unfettered power. The scandals at the IRS and the Veterans Administration, the massive spying programs targeting law-abiding citizens, inept foreign policies in the Middle East, a border with Mexico being overrun with illegals – have combined to open Americas’ eyes wide to the dangers posed by this President and this Administration. Were Douglas MacArthur or George Patton in the Congress today; they would be attacking relentlessly, repeatedly, and vigorously. Because that is how you defeat a stubborn enemy.